How do you get a 100-foot octopus onto an aquarium roof? No, it’s not the first line of a joke. 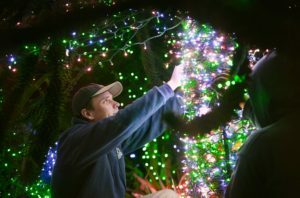 It’s just one of the challenges faced by the Zoolights crew at Point Defiance Zoo & Aquarium as they spend most of October and November prepping for the 31-year-old holiday lights show. But it’s a challenge they clearly relish. “The first thing we do is decorate all the trees and bushes,” explains Justin Pfeiffer, lead Zoolights technician. 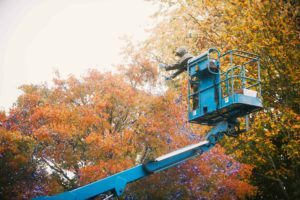 Putting up landscape lights is the first part of the job. That can take a while. Zoolights is not just famous for its creative animal-themed displays, but for a whole zoo’s worth of sparkling LED lights – this year, over 700,000, the most ever. And since the Zoo’s landscaping is extensive enough to be featured in leading horticulture publications, that means a heck of a lot of shrubs to cover with multicolored mini-lights. One big decorating challenge that most home-owners don’t have is to string lights through an entire bamboo forest. In the Asian Forest Sanctuary, zip-ties again come in handy to stop lights from succumbing to gravity on vertical bamboo. “We also take a lot of care around the cacti and agaves,” Pfeiffer says with a wry smile. The 3D Zoolights animals – like the walruses and giant octopus – are made from lights strung over wire frames. Then, after the crew has cordoned off display areas with rope lights, they start the fun part – putting up all the animal figurines. From glowing polar bears to a walrus family perched on “icebergs” made of wooden pallets, from skating penguins to the diving 3D green sea turtle, assembling a second zoo of creatures in lights takes weeks – all done in the early hours of the morning before guests arrive. But the biggest animal of them all is the giant Pacific octopus that this year is back in its old haunt – atop the North Pacific Aquarium. Glowing orange and pink, it’s a sight no other lights display can possibly match. The famous Flame Tree takes a lift to decorate. 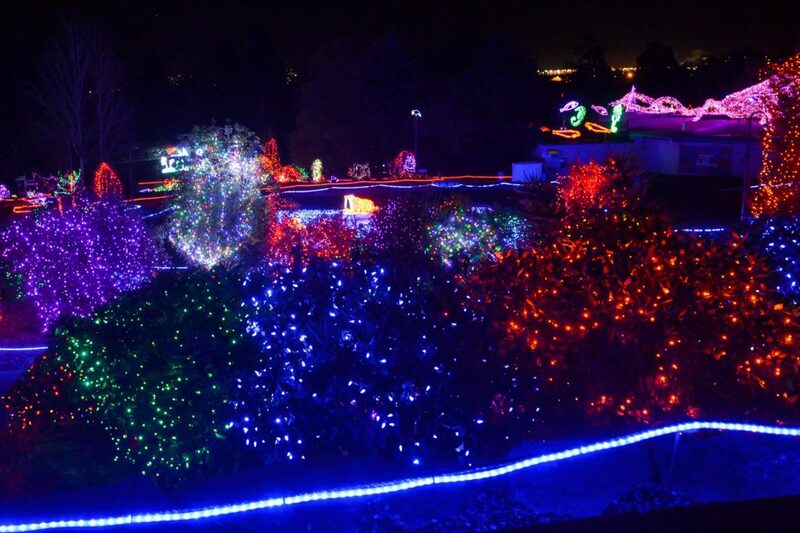 This Zoolights, visitors will still see all their old favorites: the 30,030 magenta lights on the Flame Tree, the blue-and-green of the Seahawks 12th Man, lime-green “cacti”, the roaring tiger head, diving blue orcas near the two Narrows Bridges and more. This year, Pfeiffer’s crew have some new ideas – and two brand-new buildings to play with. “The Pacific Seas Aquarium makes the perfect wall for a light projection,” says Pfeiffer, who just bought four projectors that cast a blue, water-like shimmer. He’s also planning snowflake projections dusting the ground near the penguins. And somewhere in the Zoo will be a familiar Northwest creature that’s slightly larger than life – Sasquatch. After drawing three Sasquatches in various stages of walking, Wendt projected them six feet high onto three plywood boards. She traced the figures, then drilled holes into the outlines to push through lights, which will be timed to show Big Foot walking through the trees. Where will he be? Well, Wendt and Pfeiffer still haven’t decided – so Zoolights visitors will just have to keep a look-out. “Just like the real Sasquatch,” smiles Wendt. Finally, the brand-new picnic pavilion will become a barn, full of chickens, pigs and horses – all in lights. The Zoolights view from the main plaza. 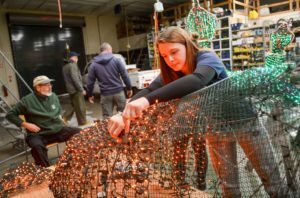 By mid-November, Pfeiffer and his crew have usually finished the Zoolights set-up. All that’s left is fine-tuning.